So you haven't had accupuncture before and are somewhat apprehensive. What will happen? Will it hurt? January 25th 2006 - Copyright by Karen S. Vaughan, MSTOM, L.Ac. You have a pretty good idea what will happen when you visit your family doctor, but what will happen on your first acupunture visit? First of all, the visit will be a lot longer than for most doctors. I usually plan on an hour and a half for an initial visitm and it will entail a lot of questions. Bring information on your insurance coverage, medical history, any drugs or nutritional supplements you are taking, and results of blood or other diagnostic tests which can be interpreted in terms of Chinese medicine diagnoses. Be sure to eat beforehand so you do not feel dizzy afterwards. You will also sign an informed consent release, in New York a statement acknowledging that you should see a medical doctor if sick and a HIPPA health privacy act statement. You will fill out a questionaire and be asked questions that might not appear to apply to your condition. For instance, you may be asked about your predominate emotional state, according to the seven emotions which apply to constitutional types in Chinese medicine. You will be asked if you run hot or cold- do you prefer cold drinks, put on a sweater before most other people do, prefer summer to winter? This helps to classify the disease state and your basic condition as to hot or cold. You will be asked about systems in your body that may contribute to the condition in terms of meridian analysis, which may not be readily apparent in western medicine. These are part of the 10 Questions, actually a series of questions that cover each of the body systems. Some of the questions may seem unusual or personal. You will, for instance, asked about the frequency, color and odor of your bowel movements and urine, about your digestion, about your sleep. If you report insomnia, then you will be asked about whether you have trouble getting to sleep or staying asleep and at what hour you awaken usually in the middle of the night. The hour corresponds to certain organ systems. Women will be asked about their menstrual symptoms, where they are in their cycle, the color and consistency of blood, PMS symptoms and length and duration of their periods. Certain points are not needled during pregnancy or a menstrual period, so it is important to report this accurately. Things you may consider dental, like bleeding gums, should also be reported. The acupuncturist may take your blood pressure and pulse count, but will certainly take your pulse manually in a way that can seem unusual. In Chinese medicine the pulse is used diagnostically and the acupuncturist listens to the movement of the blood in your blood vessels, the strength of the beat, the turbidity of the movement, the depth of the vessel and its thickness or thinness. Lipids in the blood frequently give a slippery sense to the pulse. There are 27 different traditional pulse types. The pulse is taken in at least three positions on each hand, although some systems are more involved. Each position allows the acupuncturist to feel different depths of the blood vessel because of the way it lies over the bone. Each position in Chinese medicine refers to a different organ system. The acupuncturist will look at your tongue, the shape, the color and condition of the body and fur, the presence of cracks, scallops or raised spots. She will look underneath your tongue and note if you have purple or distended sublingual veins which correspond to stagnation in the body. She may look at your facial color, your ears which contain branches of nerves that enervate the rest of your body and your eyes. Seeing, hearing smelling, and listening are all part of the diagnosis. So is palpation along the abdomen or meridians. Not every method is used by ever acupuncturist for every condition. You may not be familiar with the meridian system, but basically there are 12 main pathways in the body named after organs that lie within them. They start at the hands or feet and go into the body. These were found over 5000 years ago and have been confirmed by radioisotope injection or radiological study with the SQUID Superconducting Quantum Interference Device (which is still unfamiliar and quite expensive so usually is found in radiological research institutes.) 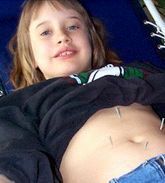 Chinese medicine inserts tiny needles or otherwise stimulates points along these meridians where energy tends to pool. You can see stimulation of the brain with an MRI when the needles are inserted. But since the meridians travel through most of the body and tend to branch, we may treat your eyes with a point on the Liver meridian located on your toe. If your left shoulder is frozen we may needle your right shoulder as well as a special point on your lower leg. The diagnosis is made before needles are inserted and may sound unfamiliar. The names are fairly technical, though they may sound poetic, and refer to constellations of symptoms. So you may have Liver yang rising and harassing the Heart, which could describes a migraine or high blood pressure that may be accompanied by anger. Each diagnosis has a variety of major and minor symptoms and it takes years to learn them. If your Kidney yang is deficient it doesn't mean that your kidneys are failing, it refers to functions associated with the meridian that includes the kidneys and adrenal glands. Typically we capitalize the meridian names so they will not be confused with the western organs, but in speech it can be confusing. Feel free to ask if you do not understand. Most acupuncturists use between 4 and 15 needles at a time. The needles are tiny, usually no thicker than a hair, and are encased in sterile packaging for single use. They are inserted into points. Usually there is no pain, but you may feel a sense of heaviness or electicity at some points. Others, especially if you need them, may have a moment of pinprick pain. If it continues more than a few seconds, tell your acupuncturist. Needles may be stimulated, reinserted in place or attached to an electrostimulation machine during your treatment. Most commonly, you rest for 15-20 minutes after the needles are inserted. You may be asked to roll over during the treatment to get a new set of needles or only one side may be treated during the visit. The needles are removed afterwards and disposed of in a sharps container. If you have been suffering with a chronic condition you are unlikely to be cured in a single treatment. However there are conditions that respond rapidly. I once treated a patient suffering with a stroke whose tongue went from 45 degrees deviated to 5 degrees deviated in a single treatment. And I have been treated for an acute finger joint arthritis that disappeared aafter one visit. People differ however in their response, and they need to avoid reinjury. You may be given herbs, exercises or stimulation to do as "homework." This will hasten your recovery or strengthen your system. Chinese exercises may seem subtle and you may wonder how they can be important compared to, say weight lifting or aerobics. However they engage the body, the breath and the brain in a way that is very profound. An individualized herbal consultation may be separate from your acupuncture treatment if it is involved. If you have herbs you need to fill the prescription promptly and to take them. They do you no good in the bag and your condition can change over time. If you are unable to cook a prescription daily, tell your acupuncturist. Some formulas are available in pill form or individualized prescriptions can be cooked and vacuum packed by the herbal pharmacy. Pills tend to be manufactured in the form of tiny balls where you would take 8-12 at a time, two to three times a day. Herbs can also be given in granular form which you add to water to drink. If you dislike the taste, make the herbs in as little water as possible and chase it with water or juice. They will not help you if you do not take the full dosage. But definitely call your acupuncturist if you have any adverse reaction. Acupuncture visits after the first one are much shorter, usually 30-45 minutes. It is important to keep your acupuncturist updated on any medications or supplements you take, herbal prescriptions you have not taken or any reactions to the treatment. Generally you will leave with a feeling of well-being stimulated by the endorphins released in response to the needling.